Using Hyper Suprime-Cam (HSC) mounted on the Subaru Telescope, astronomers have identified nearly 200 "protoclusters," the progenitors of galaxy clusters, in the early universe, about 12 billion years ago, about ten times more than previously known. They also found that quasars don't tend to reside in protoclusters; but if there is one quasar in a protocluster, there is likely a second nearby. This result raises doubts about the relation between protoclusters and quasars. In the universe, galaxies are not distributed uniformly. There are some places, known as clusters, where dozens or hundreds of galaxies are found close together. Other galaxies are isolated. To determine how and why clusters formed, it is critical to investigate not only mature galaxy clusters as seen in the present universe but also observe protoclusters, galaxy clusters in the process of forming. Because the speed of light is finite, observing distant objects allows us to look back in time. For example, the light from an object 1 billion light-years away was actually emitted 1 billion years ago and has spent the time since then traveling through space to reach us. By observing this light, astronomers can see an image of how the universe looked when that light was emitted. Even when observing the distant (early) universe, protoclusters are rare and difficult to discover. Only about 20 were previously known. Because distant protoclusters are difficult to observe directly, quasars are sometimes used as a proxy. When a large volume of gas falls towards the super massive black hole in the center of a galaxy, it collides with other gas and is heated to extreme temperatures. This hot gas shines brightly and is known as a quasar. The thought was that when many galaxies are close together, a merger, two galaxies colliding and melding together, would create instabilities and cause gas to fall into the super massive black hole in one of the galaxies, creating a quasar. However, this relationship was not confirmed observationally due to the rarity of both quasars and protoclusters. In order to understand protoclusters in the distant universe a larger observational sample was needed. A team including astronomers from the National Astronomical Observatory of Japan, the University of Tokyo, the Graduate University for Advanced Studies, and other institutes is now conducting an unprecedented wide-field systematic survey of protoclusters using the Subaru Telescope's very wide-field camera, Hyper Suprime-Cam (HSC). By analyzing the data from this survey, the team has already identified nearly 200 regions where galaxies are gathering together to form protoclusters in the early universe 12 billion years ago. The team also addressed the relationship between protoclusters and quasars. The team sampled 151 luminous quasars at the same epoch as the HSC protoclusters and to their surprise found that most of those quasars are not close to the overdense regions of galaxies. In fact, their most luminous quasars even avoid the densest regions of galaxies. 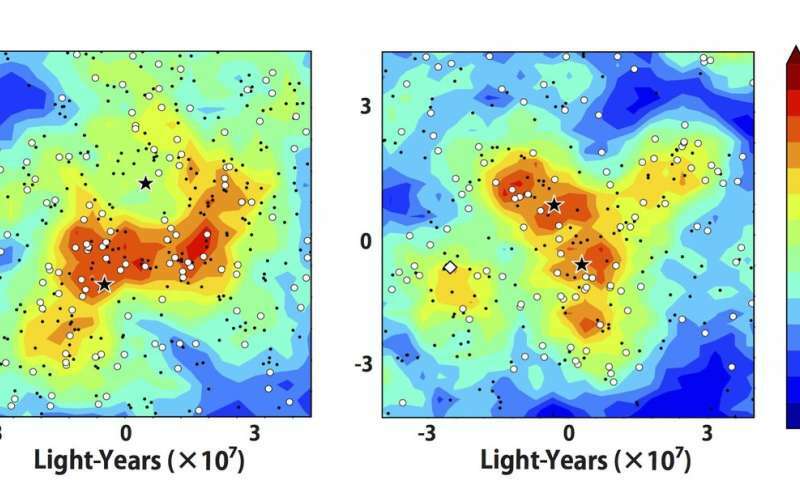 These results suggest that quasars are not a good proxy for protoclusters and more importantly, mechanisms other than galactic mergers may be needed to explain quasar activity. Furthermore, since they did not find many galaxies near the brightest quasars, that could mean that hard radiation from a quasar suppresses galaxy formation in its vicinity. On the other hand, the team found two "pairs" of quasars residing in protoclusters. Quasars are rare and pairs of them are even rarer. The fact that both pairs were associated with protoclusters suggests that quasar activity is perhaps synchronous in protocluster environments. "We have succeeded in discovering a number of protoclusters in the distant universe for the first time and have witnessed the diversity of the quasar environments thanks to our wide-and-deep observations with HSC," says the team's leader Nobunari Kashikawa (NAOJ). "HSC observations have enabled us to systematically study protoclusters for the first time." says Jun Toshikawa, lead author of the a paper reporting the discovery of the HSC protoclusters, "The HSC protoclusters will steadily increase as the survey proceeds. Thousands of protoclusters located 12 billion light-years away will be found by the time the observations finish. 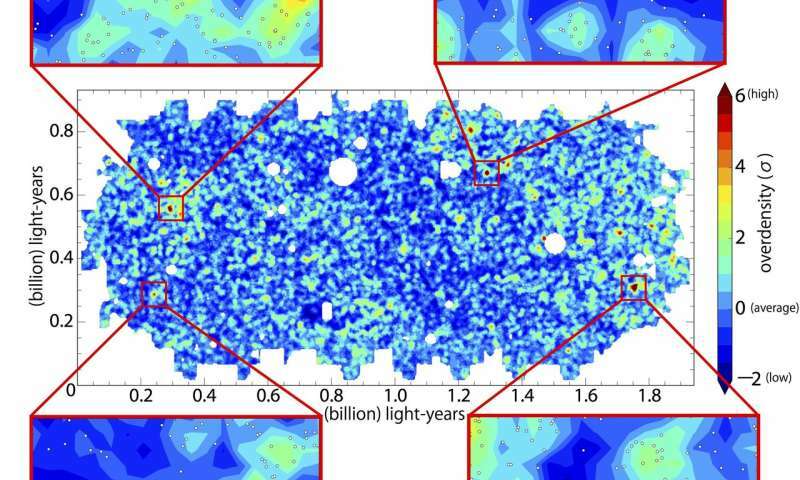 With those new observations we will clarify the growth history of protoclusters." "When a large volume of gas falls towards the super massive black hole in the center of a galaxy, it collides with other gas and is heated to extreme temperatures." In the universe there is no up and down. The same rules apply to the North or South Pole. Gathering = Movement. Why would the "downfall" be an extremely hot process? Why, this is not true for the movement? What heats the gas, in the author, gas furnace?Happy is he who does not think. So spaceship that goes to the "black hole", becomes hot, 15,000 ly before entering into a black hole? The diameter of the center of the galaxy is ~ 30,000 ly from the north to the south pole. In the universe there is no up and down. But objects can still fall onto more massive objects. Or, if you're close to an object with enough mass, every direction leads to 'down'. Your statement: down = south and north pole, equator and every other point. How, you, distinguish the south and north poles (both are down). What is south and what is north? First, why do quasars not show up in very many protoclusters? Second, why, when they show up in protoclusters, are there two? Still, the sample size is small so far. As this project continues we should get more data. If these trends keep up, this could be a big clue to galaxy dynamics. First, why do quasars not show up in very many proto-clusters? Small sample. And it is a matter of enough time to grow sufficiently internally. See a newly forming quasar in my first post. The growing core seen by Spitzer is dissipating the surrounding galaxy. And daughter galaxies are diverging therefrom. Eventually, all that will left is the bare growing core, a quasar. Because regions of high mass density provide the sub-quantum fertile conditions for more rapid formation of new matter, growing surrounding stars more rapidly. Hence, more likely a second rapid quasar forms. It already has, to those with a bit of logic. Sorry maniacs. You will never win. ...The ability of black holes to swallow gas is actually quite limited: the faster the gas is falling, the more radiation gets generated in accretion disk, the more gas gets blow out by radiational pressure. This is an unstable feedback system, leading to a collapse of the very mechanism by which the intellectually challenged merger maniacs cling to as an explanation. Such a system has a very limited lifespan, so that the extremely luminous systems that we actually observe should be at best, very rare. But the maniacs still cling, since they got nothing!